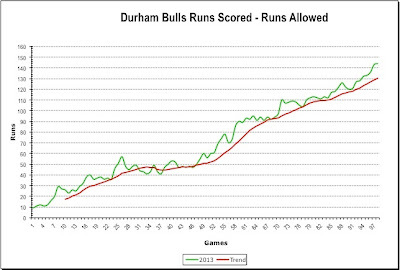 The Durham Bulls are 98 games into a 144-game season. 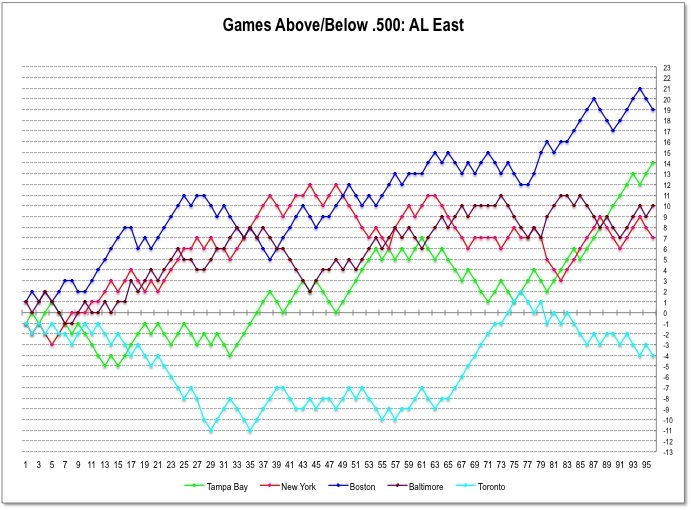 They have 21 home games left and 25 away. Their last home game is August 25, not much more than a month away. How are they doing? Great! The Bulls are 28 games above .500 and lead their nearest opponent in the South Division (the Norfolk Tides) by 11½ games. 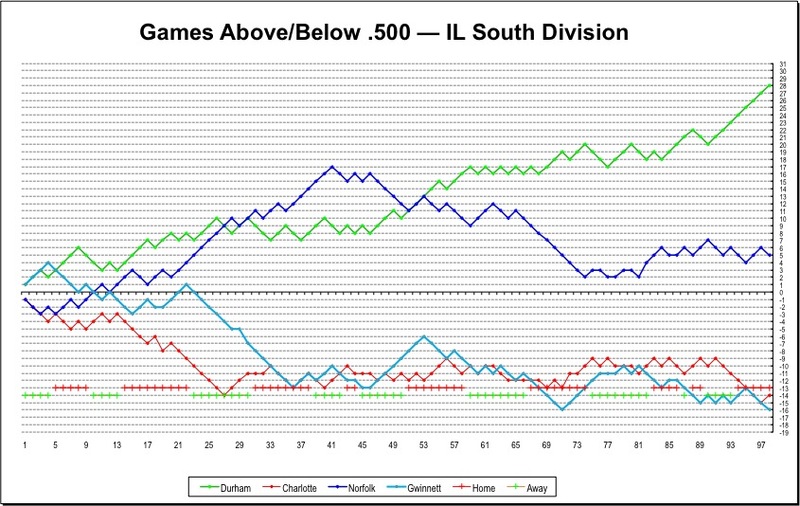 At 63-35, they have the best record in the International League. All charts can be seen in a larger size by clicking on the chart. Looking at my favorite performance metric — cumulative runs scored minus runs allowed — the Bulls look equally spectacular, although just sightly below the great team of 2010. 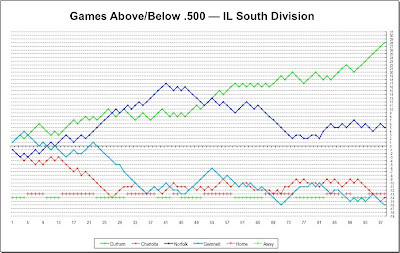 That team, by the way, way “only” 18 games over .500 at 98 games, but went on to end the season 33 games over .500 and far ahead of their nearest South Division rival. 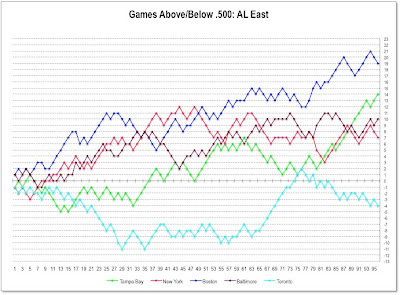 The pitching up to the break has been beautiful as well. 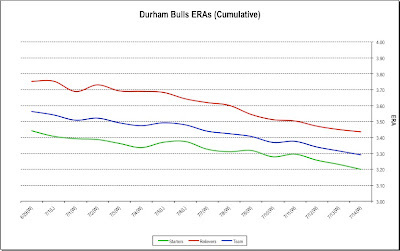 The cumulative ERAs of the starters and relievers has shown a steady decline over the last 20 games with the results showing in the 15-5 record over that same period. 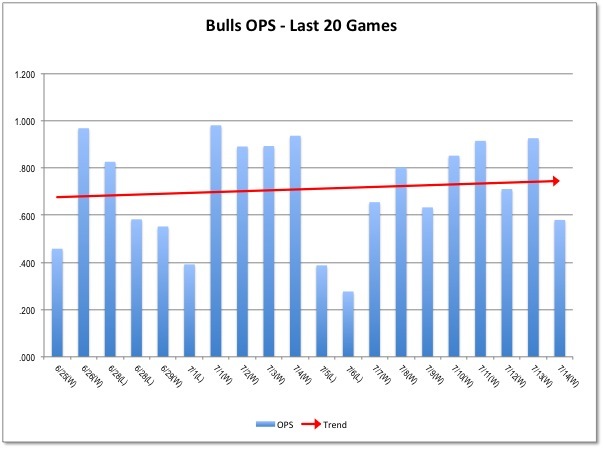 If we look at the hitting as seen in the game-by-game OPSs over the same 20 games the Bulls are consistently above .600. 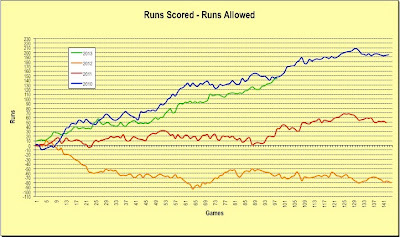 That will win you a lot of games. 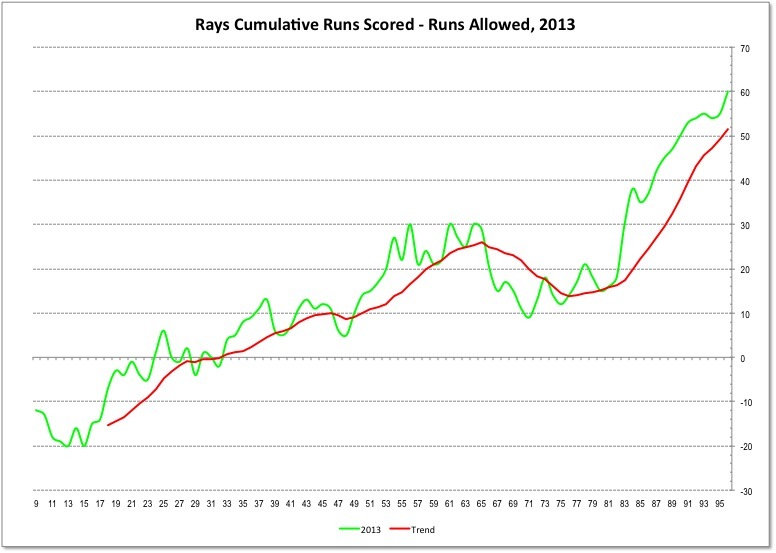 How about our friends down in the bandbox by the bay, the Tampa Bay Rays? Not bad. 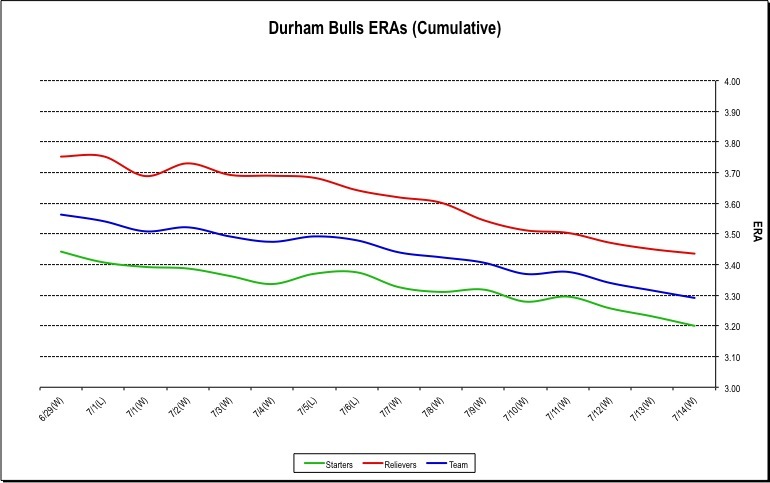 Not as good as the Bulls, but not bad. 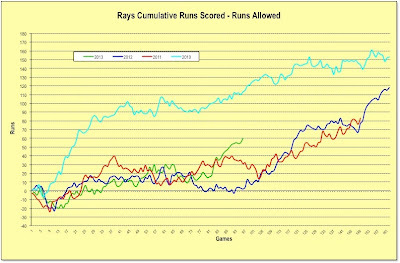 At 96 games into the season, the Rays are 14 games above .500, and trail the Red Sox by 2 ½ games in the tough AL East. 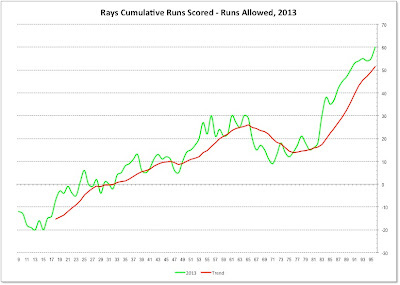 The Rays cumulative runs-scored, runs-allowed chart is showing substantial improvement over the last few weeks. 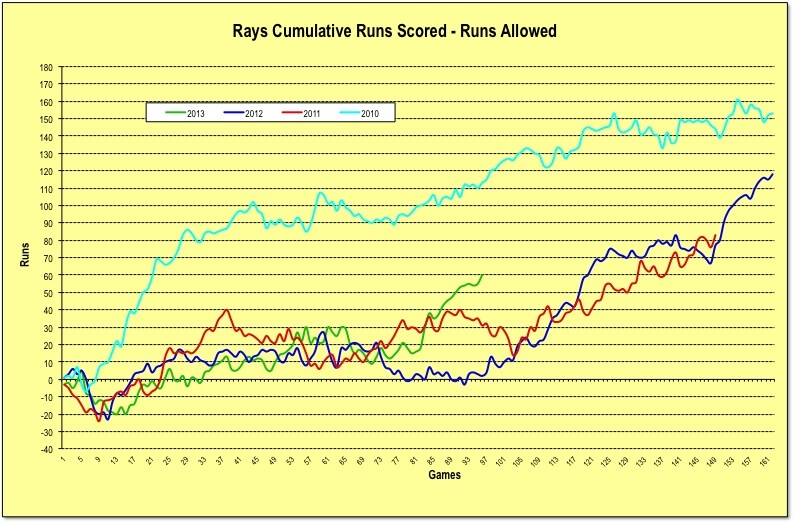 Looking at their history, an optimist might conclude that the Rays are on track to reach for the heights of 2010, much like the Bulls.